Along girlish styles in cheerful prints and sunshine shades comes forth Miuccia Prada with her wonderfully weird nymphs and scrambles the fashion puzzle. "In this ever changing world, it's time for new creativity," Prada said backstage after her much applauded show Tuesday evening, explaining the unconventional collection. For a starter, the color palette had little to do with summer: moss green, bark brown, maple red and blueberry. Unlike the folksy gals which many designers are proposing for next summer, Prada's models seemed unreal, with their pale skin, braided hairstyles and figures camouflaged in loose-fitting styles. The show's decoration - murals with naif paintings of woodland creatures - hinted at a fairy tale theme. Wrong again. "My collection is about looking forward. About a woman's imagination in our changing world," the designer said. To interpret the contemporary fantasy world, the designer said she went against her own tendency toward stiffness, to present a collection which would emanate softness. The styles in fact are mainly in tulle and cotton jersey, with wide skirts and bell-bottom pants helping to smooth the sharp edges of Prada's signature minimalist style. The show was chock full of little dresses, jumpsuits with delicate Chinese embroidery, knitted sweaters, and a myriad of diaphanous tops. Most of these styles were fashioned in prints reflecting the drawings that lined the walls of the Prada theater. 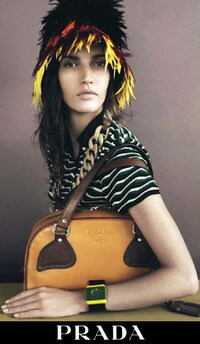 But where Prada really let go was in the footwear and the wildly patterned stockings that accompanied it.